I found this great post at Southern Savers, I thought you might enjoy on how to make your own Resurrection Eggs . My daughter just loves pulling these out each year. Now that she is almost four years old, we are moving to the book Benjamin’s Box: The Story of the Resurrection Eggs This book is a little more advanced than the Miss Pattycake one. One of her favorite things to do is, I hide the eggs and she finds them. 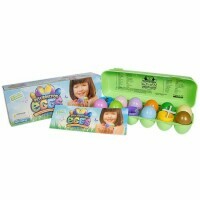 Then we sit down and she picks each egg and explains to me what the item in the egg means in relation to Easter. When she gets it right we do a “high five”. (I think that is her favorite part!) It has been a great way for her to learn about The Crucifixion and Resurrection, while having lots of fun!